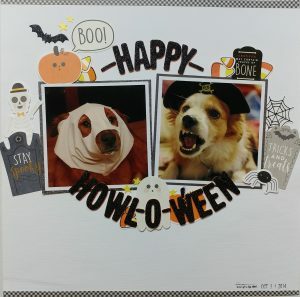 fur babies Archives - Pebbles, Inc.
Spooky and Sweet moments with Guest Designer Karla Der! We had a halloween photo shoot with a friend last year and this was one of the fun pictures we got. My girl got to dress up as Ray and Wonder Woman last year. I love the strong female role models little girls have these days! 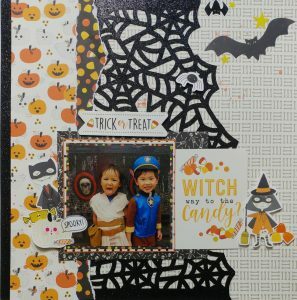 For this layout, I cut the spider web glitter background and layered it with some of my favorite patterned papers. The title is actually a card from the cut apart 12×12 paper. My furry monsters get to dress up too. The big one tolerated a homemade ghost costume. That’s a big deal because he’s afraid of most costumes, so we won’t dress him up. The little one doesn’t mind costumes at all. Although he looks like he’s saying ‘argh’, he’s actually in the middle of eating a well deserved treat! I used my thickers alignment guides to make a circular title with the black glitter thickers. I had a lot of fun using the ephemera pack and stickers to make little embellishment clusters around the photos. Embellishment clusters are my favorite part of making a scrapbook layout, and they were so easy and fun with this collection. I hope I’ve inspired you to pick up Spooky Boo for your Halloween crafting!